RNA-binding proteins (RBPs) are crucial regulators of cellular biology, and recent evidence suggests that regulation of RBPs that modulate both RNA stability and translation may have a profound effect on the proteome. However, little is known about regulation of RBPs upon clinically relevant changes of the cellular microenvironment. The authors used high-throughput approaches to study the cellular RNA‐binding proteome in differentiated tubular epithelial cells exposed to hypoxia. They identified a number of novel RBPs (suggesting that these proteins may be specific RBPs in differentiated tubular epithelial cells), and found quantitative differences in RBP-binding to mRNA associated with hypoxia versus normoxia. These findings demonstrate the regulation of RBPs through environmental stimuli and provide insight into the biology of hypoxia-response signaling in the kidney. Background RNA-binding proteins (RBPs) are fundamental regulators of cellular biology that affect all steps in the generation and processing of RNA molecules. Recent evidence suggests that regulation of RBPs that modulate both RNA stability and translation may have a profound effect on the proteome. However, regulation of RBPs in clinically relevant experimental conditions has not been studied systematically. Methods We used RNA interactome capture, a method for the global identification of RBPs to characterize the global RNA‐binding proteome (RBPome) associated with polyA-tailed RNA species in murine ciliated epithelial cells of the inner medullary collecting duct. To study regulation of RBPs in a clinically relevant condition, we analyzed hypoxia-associated changes of the RBPome. Results We identified >1000 RBPs that had been previously found using other systems. In addition, we found a number of novel RBPs not identified by previous screens using mouse or human cells, suggesting that these proteins may be specific RBPs in differentiated kidney epithelial cells. We also found quantitative differences in RBP-binding to mRNA that were associated with hypoxia versus normoxia. Conclusions These findings demonstrate the regulation of RBPs through environmental stimuli and provide insight into the biology of hypoxia-response signaling in epithelial cells in the kidney. 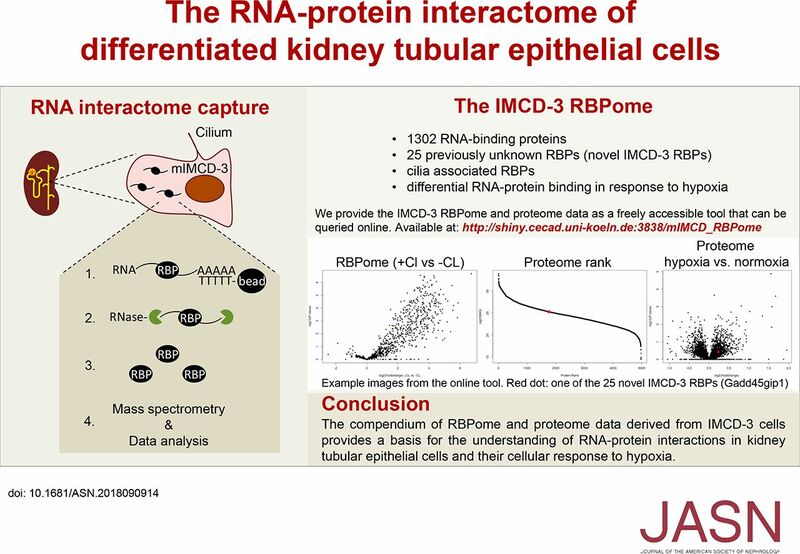 A repository of the RBPome and proteome in kidney tubular epithelial cells, derived from our findings, is freely accessible online, and may contribute to a better understanding of the role of RNA-protein interactions in kidney tubular epithelial cells, including the response of these cells to hypoxia.